In this post, I have mentioned list of ITC codes which help exporters and importers of PREPS. OF CEREALS, FLOUR, STARCH OR MILK. ITC is also known as Indian Trade Classification (ITC code), RITC etc. These HS codes helps exporters and importers of PREPS. 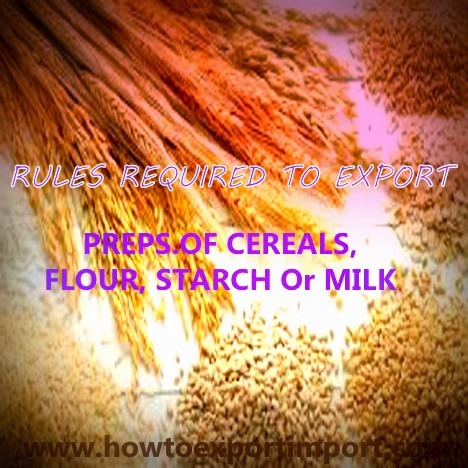 OF CEREALS, FLOUR, STARCH OR MILK to identify their product to use in customs department and other government and non government agencies in India to import or export of PREPS. OF CEREALS, FLOUR, STARCH OR MILK. I hope the information in this post supports exporters and importers of PREPS. OF CEREALS, FLOUR, STARCH OR MILK. The buyers of PREPS. OF CEREALS, FLOUR, STARCH OR MILK from India and sellers of PREPS. OF CEREALS, FLOUR, STARCH OR MILK from India in import export trade may use these ITC codes mentioned. The suppliers of PREPS. OF CEREALS, FLOUR, STARCH OR MILK from India and buyers of PREPS. OF CEREALS, FLOUR, STARCH OR MILK in India may please be noted, apart from six digit HS code, commonly adopted worldwide, additional two, four or six digit product classification code is accepted in other countries. Hope this article helps importers of PREPS. OF CEREALS, FLOUR, STARCH OR MILK from India and exporters of PREPS. OF CEREALS, FLOUR, STARCH OR MILK from India . Comment below your thoughts. Nancy Queenland : On 18 February 2015 I am a food trader, and this is my first transaction my question is that: when issuing the documents I can write the following: .Exporter: me .Manufacturer: Factory that will sell for me the goods .Importer: my customer is this true, or you have another recommendation? Suresh T : On 21 July 2015 I like to do export business and want to know the details of exporting items and procedures if you conducting class means inform me i would like to join in the class.